There are basically three different types of injections: intradermal, intramuscular and subcutaneous. Each type of injection is used for a specific purpose, but the procedures for preparing the injections are the same. Obviously, washing the hands is vital before any medical procedure. Then the needle and syringe are prepared for use and the medication is loaded up. Lastly, the injection site is sanitized and prepped. An intradermal injection is the technique used to inject fluids into the dermal, or top layer of the skin. It is most frequently used to test for certain health problems, including many allergies and tuberculosis. This type of injection is administered in an area of the skin that is soft and pliable. The fluid that is inserted with an intradermal injection will lie just beneath the skin’s surface in between the layers of skin. This sometimes causes the site of the injection to swell or be slightly raised from the surrounding skin. An intradermal injection is administered with a special needle that is extremely tiny, and it must be inserted at a very particular angle in order to deposit the fluid properly under the surface of the skin. The intramuscular injection is the most common way of injecting medication directly into a patient. This is an especially useful technique when rapid absorption of the medicine is important, because the fluid from this injection is inserted directly into a muscle. This makes it possible for the medicine to gain easy access to the blood stream and quickly begin to flow into the system and begin its healing work. Intramuscular injections are the best tolerated form or injection, and they are also the safest way of injecting medication into a patient. An intramuscular injection is frequently used in cases where another kind of injection might cause an irritation or bad reaction. One of the most common muscles used when administering an intramuscular injection is the gluteus maximus, which is the muscle found in the buttocks. Intramuscular shots are also given in the muscles of the thighs and upper arms. 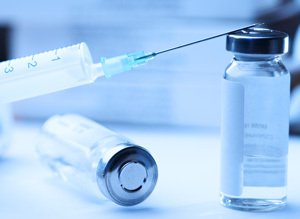 Subcutaneous injections are used in cases where the medication needs to be absorbed slowly, as opposed to the intramuscular injection which provides rapid absorption. When administering a subcutaneous injection, the needle has to go through the first 2 layers of skin – the epidermis and dermis – and penetrate into the fatty layer of the skin, known as the subcutaneous tissue. Medications administered subcutaneously are those least likely to cause a reaction, so they do not need to be injected deep into the muscle tissue. Insulin is one type of medicine that is injected in this way, as are a number of immunizations. Each type of injection has a very specific purpose, and they each require particular sizes of needles. The deeper the injection, the longer the needle should be, so an intramuscular injection will usually require a needle that is at least a few inches long. Subcutaneous injections are generally done with a needle that is approximately an inch long. If the needle is too long, it may be inserted too far and the medication will not be properly administered. Intradurmal injections use the shortest needle because they are only inserted just beneath the first layer of skin.